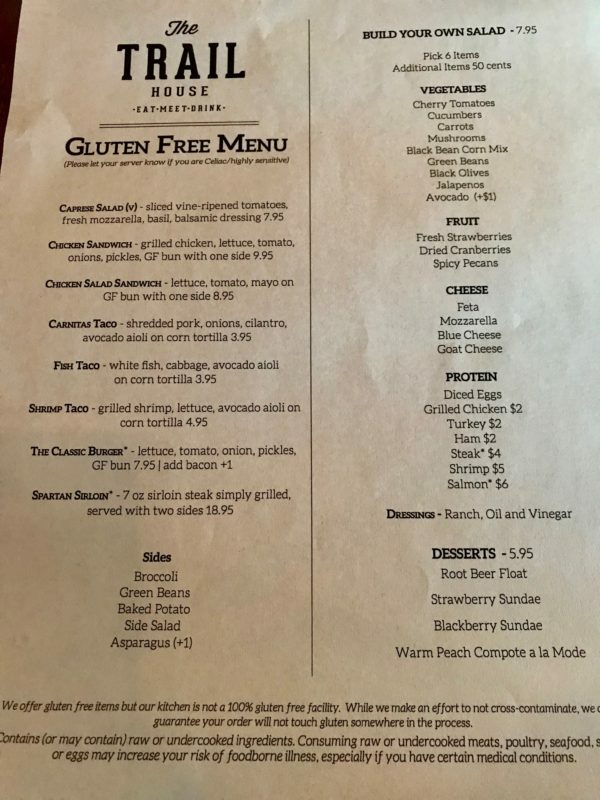 Update (8/2/18): A couple months ago, Jason, the owner of The Trail House, commented on this blog to let me know that they were updating both the regular and gluten-free menus. I was really impressed that he reached out to me. Recently, he let me know that both menus had been updated. This past weekend, we finally had the chance to return. The updated gluten-free menu has tacos with corn tortillas (they’re also soy-free). Trail House has a fancy new gluten-free menu. We think it’s really awesome that The Trail House updated their menu and added more options. Unfortunately, Nikki can’t have fish or pulled pork. 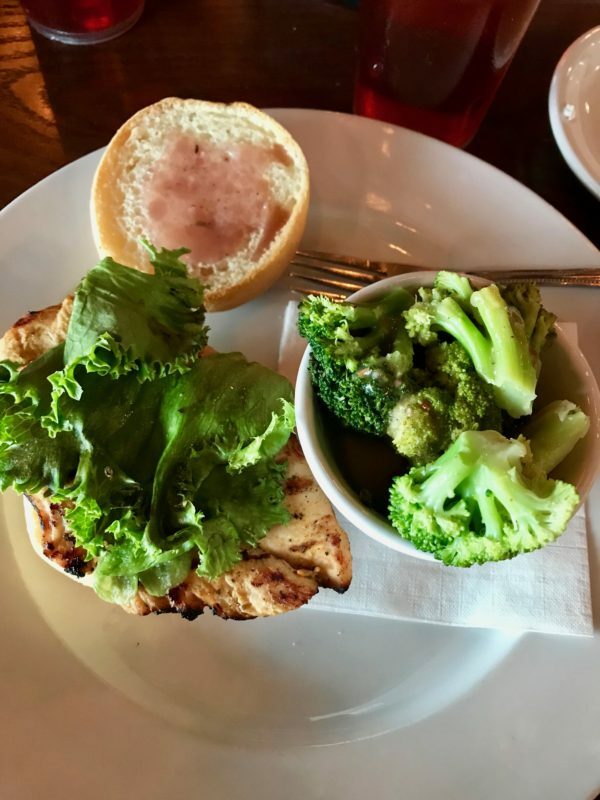 She was concerned how she would react to the carnitas taco, so she decided to get the chicken sandwich with a gluten-free bun and a side of broccoli. Nikki also brought her on dressing this time. 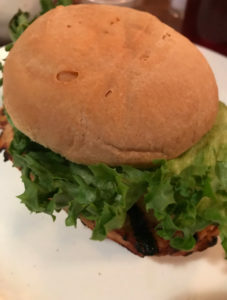 She really wanted the chicken sandwich because she doesn’t get to eat them often since most place marinade them with a soy-based oil. While she got the same thing that she did the first time, there are many options that you might enjoy. Even better this time since Nikki brought her own dressing. They also updated the original menu. Though I really wanted another Trail House Grilled Cheese sandwich, I decided to get the Cuban (which was on the previous menu). This Cuban has pulled pork on it. While it was messy, it was so yummy! 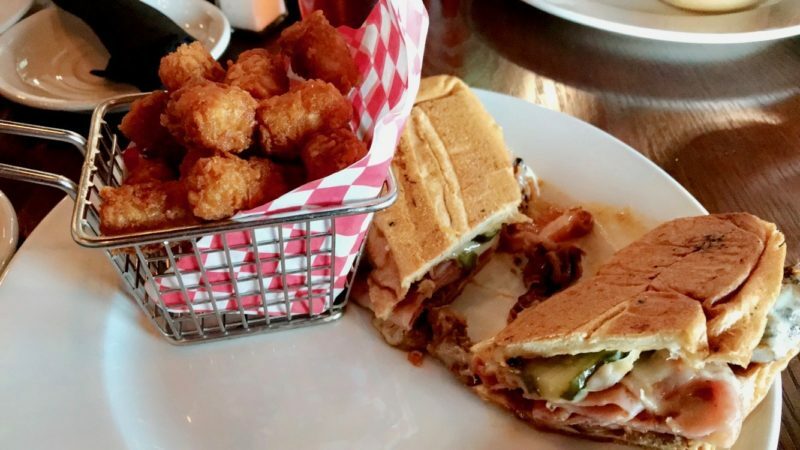 I recommend both the Cuban and the Trail House Grilled Cheese sandwich. My dad also ordered the same sandwich as last time. This Cuban was messy in a good way. A few weeks ago, my dad invited Nikki & I to dinner. I told him that I had reviewed all the restaurants we’d been to and instead of going to one of our regulars, we should try somewhere new. He suggested a place he’s been to a couple of times about 20 minutes from us called The Trail House. We agreed to try it out, even though the menu on their Facebook page didn’t say if they had anything gluten-free. At the very least, Nikki could order a hamburger with a lettuce bun. Not very filling, but it works when needed. The Trail House is located in Indian Trail, which is a town just outside of Charlotte. It’s in a really good location near a movie theatre along with a handful of other restaurants. On Sundays, they have a breakfast buffet including a waffle bar. The breakfast buffet is $14 for adults and kids eat for $7. I don’t believe the breakfast buffet has gluten-free options. One side of the restaurant has a stage for live music on the weekends. We were seated on the opposite side (their bar area is between). Since it was a Friday, it was quite packed when we got there. Though it isn’t on their Facebook (their website domain hasn’t been renewed), they do have a separate gluten-free menu. I thought I took a picture of it, but can’t find it. They had a small variety of options. Nikki chose the grilled chicken sandwich with a gluten-free bun and a side of broccoli. Nikki has come to discover that there are some good gluten-free buns and some that are gross. She approves the buns from The Trail House. 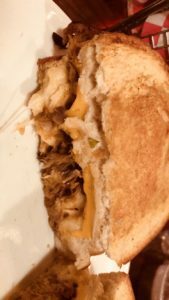 I decided to try the Trail House Grilled Cheese. It’s American cheese, pulled pork, and mac & cheese. It came with a side of tater tots. My dad’s service dog, Caine, was thrilled as he is a huge fan of tater tots. We all had so much food that he got his fair share of tots. When I was in Dallas several years ago, I had a similar sandwich and it was delicious. 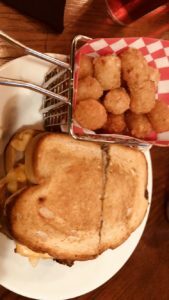 The Trail House Grilled Cheese did not disappoint! I ended up taking one half of the sandwich home because it was so big. It made for a delicious lunch the next day. My dad went with Ol’ Blue’s Breakfast Burger. This burger consists of fried egg, applewood smoked bacon, mayo, and American cheese. He also got a side of tater tots. He really enjoyed his meal and made a happy plate. I definitely recommend The Trail House! There are a variety of yummy options for everyone. I forgot to take pictures of the Ol’ Blue’s Breakfast Burger. Never fear, I have several pictures of my sandwich to satisfy your #foodporn needs. I’m so glad I was able to make two meals out of this. I want another one right now. For other restaurant reviews, check out CharBar No. 7, Red Robin, Showmars, and Chili’s. Don’t forget to follow GFS on social media with the handy buttons below. Oh my word Sam that sandwich does look HUGE. I love going somewhere and getting big generous portions that you can take home and still enjoy the yumminess later. Pity about Nikki getting a tummy ache though. It must be so difficult to double check everything before you eat it. I do too, Michelle! It’s nice to get two meals for the price of one. 🙂 That was a bummer, but luckily it was a mild discomfort and nothing too bad. That’s one of the questions she has to be sure to ask anytime she orders grilled chicken (if it’s pre-marinated or not & what it’s pre-marinated in). The meal look super tempting and the sandwiches look huge. I am sure I need to share it with someone. If not, it would be good for two meals, breakfast and lunch – just like what you did. You might be able to eat it all in one sitting if you hadn’t had a meal in a while or it was your first one of the day. 🙂 It was nice to be able to enjoy it twice. This looks delicious and would love to try this out. Totally agree with you sometimes photos don’t do justice. Oh those all look delicious! I think I’d want to eat the breakfast burger even though it would probably make me poorly! You go to so many places where the food looks yummy! The breakfast burger has become more popular recently. I haven’t tried it yet, but my dad has ordered it at a few places and really seems to like it! Never heard of the trail house. Good on you for sharing some options for people with restrictions – I have a LOT of restrictions so I know how difficult it can be to find food I can eat. It can really be difficult, especially when trying to going places with family or friends. I know you can appreciate the struggle, Amy-Lynn. Its really great when places cater well for people with dietary needs. The tater tots look amazing! It really is, Elizabeth. They were SO good! Those foods look really delicious. This Ol’ Blue’s Breakfast Burger is definitely a must try. It makes my mouth-watering. yummy!!! It was really good and I’m ready to plot my next visit! It can be awkward in a restaurant to take photos. I can’t exactly stand on chairs. lol Tater tots are so good! Wow, love the choices for gluten free delicacies! With so many people having issues and needing food restrictions, sounds like this was an amazing place to dine! It was, Julie! It’s always nice to add a new restaurant to the list so that you don’t end up at the same places all the time. Wow. 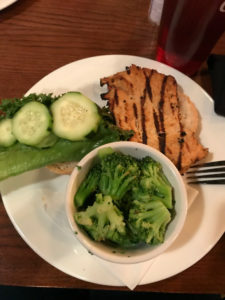 Now we know what to order even if we have dietary restrictions – and these look so delicious and satisfying! They were! It’s always great to find food that fit dietary needs and still taste good! Hey there. Thanks for the great review. I own The Trail House, and we do put effort into providing options for people with dietary restrictions. We did lose our website recently (long story), but we have a new one coming very soon. It will include our gluten free menu. We are also redoing all of our menus, and our new menus will make it clear that a gluten-free menu is available. We do marinate our chicken, but the marinade does not include gluten. We are not a gluten-free kitchen, and while the chef is careful to not cross-contaminate, it is always possible. 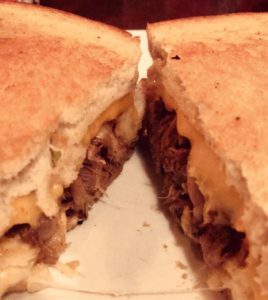 The Trail House grilled cheese is one of our most popular menu items, and it is more than a meal for most people. Jason, thank you for reading the post and for your response! 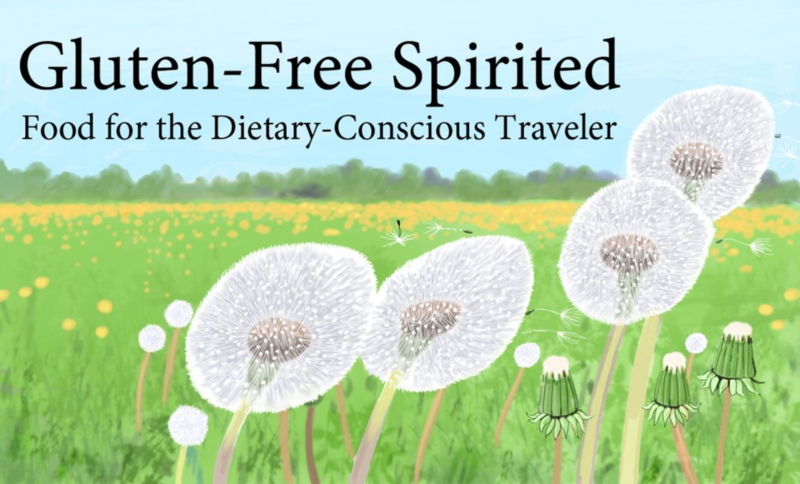 I’m glad to hear that a new menu is coming (along with a website) and that it will be clearly noted that there is also a gluten-free menu available. We’ll be really interested to see what’s on it. If I’m not mistaken, most marinades contain soy. My sister can’t have soy either (along with gluten & dairy), so that’s why she was concerned about anything pre-marinated or cooked in vegetable oil (it contains soy). Luckily, she’s not allergic but she does have intolerances to all three. The Trail House grilled cheese is SO delicious! I’m pleased to announce that we’ve launched our new dinner and lunch menus, including a brand-new gluten-free menu. Take a look and let me know what you think. I really appreciate you keeping us updated, Jason. The menu looks great! My sister has a question-do you know if the corn tortillas have soy? We definitely need to come in for a visit soon! I’ve checked and there is no soy in our corn tortillas. Thanks for checking and letting us know! We’ll try to get back soon!